Using color to boost your family's nutrition. March is National Nutrition Month, a campaign sponsored by the American Dietetic Association to promote healthy living. This year’s theme is Eat Right with Color. The health benefits of eating a variety of fruits and vegetables are well documented. Still, less than 15 percent of children eat the recommended number of servings of vegetables and less than 25 percent eat the recommended servings of fruits. 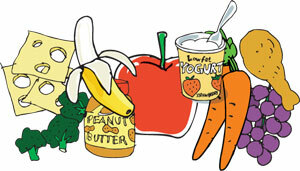 Consider the following snack ideas to lend color and nutritional value to your child’s diet. After microwaving a small baked potato, top the spud with salsa and low-fat cheese for a quick afternoon pick-me-up. Add diced chicken, beans or lean ground beef and serve with a bowl of soup or a side salad to turn this tasty snack into a filling meal for the whole family to enjoy. Dip a peeled banana in low-fat yogurt. Next roll the fruit in a crushed low-sugar cereal and freeze. You can also try this recipe with crushed nuts, raisins and granola for variety. Alternate layers of low-fat pudding or yogurt with fruit in a tall glass or parfait cup to make a sky-high fabulous fruit parfait. Top with crushed graham crackers or vanilla wafers for extra crunch and sweetness. Visit your local discount store to find festive dishes and spoons for enjoying this delicious treat. You can also make a parfait in an ice cream cone, but avoid using graham crackers or wafers when amending the recipe to keep the calorie count low. Pizza can be fun and healthy with the right ingredients. The family favorite can also be a great way to encourage your kids try new vegetables. Use whole-wheat tortilla wraps or pita pockets as the crust. Next comes the sauce, low-fat mozzarella cheese and as many veggies as you can pile. To make the meal prep even more entertaining, suggest kids create faces on the pizzas with the veggies. For further nutritional insight, including tips on adding color to your family’s diet, visit www.eatright.org. Laura Gibofsky is a registered dietitian whose interests include pregnancy, pediatric and adolescent nutrition, weight management, diabetes, meal planning and general wellness. Gibofsky received her bachelor of science degree in dietetics and completed her dietetic internship and master’s in public health nutrition, with a specialty in maternal and child nutrition. She is currently working as a clinical dietitian and developing a private practice. 10 Winter Care Tips By Joshua L. Fox, M.D. To manage psoriasis and eczema. 4 Keys to Communication By Judith L. Page Ensure tech time doesn't replace talk time.